Soaring Eagle Dairy located in Newton, WI has had their Calf Star Large Frame Calf Milk Pasteurizer since February of 2009. Soaring Eagle has a 900 cow dairy where they currently are feeding and growing 101 calves. In those 101 calves there is a total of 10 bull calves. These calves stay on the milk for about 5 weeks when they are then transferred to a second barn and eventually after 5 months and 450 pounds they are sent off to Colorado. 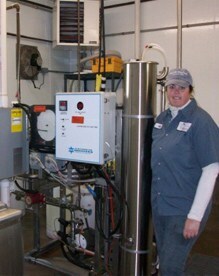 By using the Calf-Star large frame pasteurizer this farm has picked up 60 pounds at 5 months for their calves.